May 1945 — the end of World War II. Time to drink a beer, have fun, and enjoy the countryside. But hold on — what’s that on the horizon? A Nazi Panzer division? George Jaeger was born in Vienna, emigrated to the U.S. and became an interpreter for the U.S. Army. He later served as a Foreign Service officer. You can read about his experience with the Kindertransport, when he and thousands of other children were taken to the UK right after Kristallnacht. 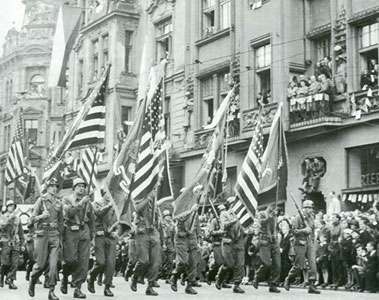 JAEGER: By early May the German Army had virtually disintegrated, the Americans and the Russians had met at the Elbe, the battle of Berlin was under way and we all knew, as we pressed on across the Bavarian border, that the war was almost over. In our final push Fifth Corps’s Sixteenth Armored Division, supported by another Division from the south, liberated Pilsen on May 6, 1945 – a glorious, deliriously happy day. 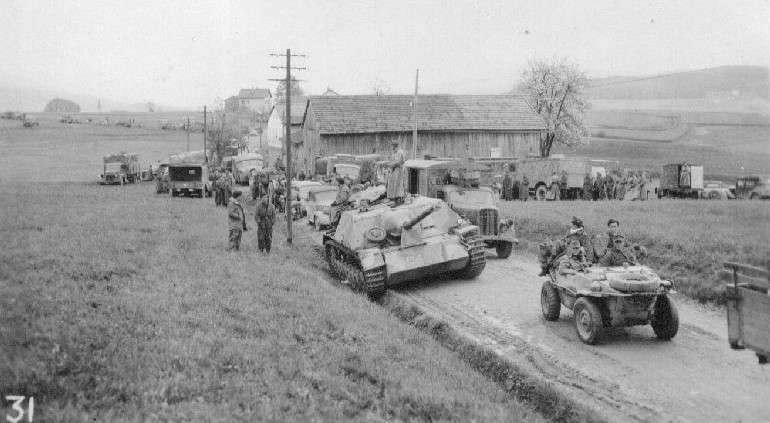 I remember vividly how our command car, wedged into an endless column of muddy American trucks and tanks of the 16th Armored Division, rolled into town (at left). The long streets running through Pilsen’s then grubby, rundown suburbs were lined with thousands of jubilant, cheering Czechs! Girls were throwing us flowers, people were singing and shouting, everyone was waving flags and handkerchiefs and, although desperately deprived after years of war and occupation, people offered us sausages, bread and even bottles of the then very thin Pilsner beer. On a particularly lovely day just after our arrival in Pilsen I “liberated” a bike, slung my carbine over my back and, with a sandwich in my pocket, went off to explore the countryside. I may have gone several miles, whistling and celebrating in my own way that the war was over, when, coming around a bend on a narrow dirt road at the edge of a forest, I found myself staring directly into the cannon of an SS tank with a fresh and lively looking crew of SS soldiers on top! To make matters worse, behind it I could see a seemingly endless column of other tanks, their SS standards flying, their weathered, battle hardened crews perched on the turrets sunning themselves, all silently staring at me! It was a totally absurd situation! The question, of course, was: What do you do on a bicycle, with your carbine on your back, when you are looking at a German SS Panzer division at about 20 yards? If I stopped and reached for my gun, I was clearly a dead duck. If I didn’t, and just went on biking, I remember thinking, I would at least not be shot in the back and would show them that I was not a coward! So I biked on, past the first tank, waved at the fellows in the tank, who looked absolutely “gobsmacked,” as the British would say, then past the second. Nothing happened! After passing a dozen or so more tanks, I saw someone waving farther down the line. An SS officer came running toward me. This is it, I thought. 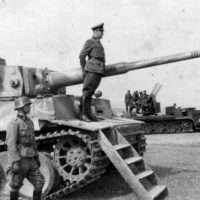 But he only signaled that I should stop, then stepped aside and left me facing the SS Panzer Division’s SS leather-jacketed Commanding General standing between two tanks, surrounded by several other officers! He explained, formally and very politely – my German was very helpful at this point – that they had retreated before the oncoming Soviet forces and had been hiding for several days looking for a safe way to surrender to the Americans! My arrival was therefore most fortunate, since they did not want to become involved in any accidental fire fight with the Americans. Would I therefore accept the Division’s surrender on behalf of the United States? I tried to look as dignified, under these clearly historic circumstances, as was possible for an only recently promoted Private First Class; said I would be glad to do so; but needed the General’s Luger pistol as a token of his surrender to take to my superiors! He simply handed it to me, we shook hands and both saluted. I got back on my rusty bike and pedaled back, the way I had come, waving to my prisoners of war with new assurance! Back at V Corps Headquarters it took a bit of convincing, given the nature of chains-of command, to get some follow-up. When I told my sergeant that I had just accepted the surrender of an SS Panzer division, he came very close to putting me on a week’s KP [kitchen patrol]! Even when I had talked my way up the ladder, a major on duty was certain there were no stray Panzer divisions around. So my facts were confirmed and a second more “official” surrender was arranged, to which, I am annoyed to report, I was not even invited! 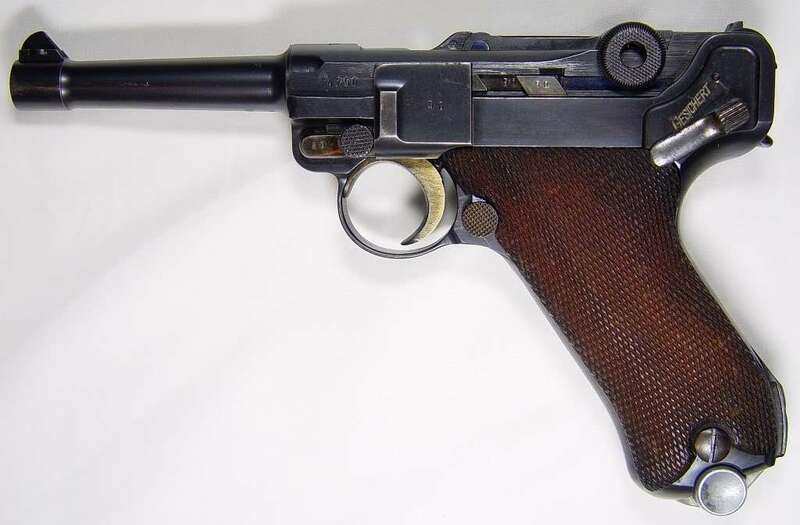 They even kept the Luger!